Prior to the invention of the Lock-N-Lift tool, the usual method for handling steel trench cover plates weighing thousands of pounds was for workmen to first pry up one end of the plate with a crow bar and then place a wedge, such as a block of wood, under the lifted edge. A workman would then reach under the plate and thread a chain into a hole drilled close to the plate edge. The plate could then be lifted by a device such as a crane. Because the hole was not on the center of gravity of the plate, it would generally swing back and forth and spin while it was moving, making it difficult and dangerous for workmen to guide it to the desired location. These swinging plates accounted for many lacerations and fractures. Injuries also occurred while reaching under the plates to attach and detach the chains. Storing of plates also proved difficult. When stacked plate to plate, they were extremely difficult to pry apart; and if they were stacked with dunnage between the sheets, the stacks became unstable. These were the standard practices for handling steel plates when inventor, Fred Silva, worked in the utility repair business during the 1950’s and 60’s. The Lock-N-Lift Tool resulted from Fred Silva’s desire to find “A Safer Way” to handle trench plates. He developed and patented his first tool in 1981, the Lock-N-Lift model 500. It was the first quick-release lifting tool with a dovetail design. The tool locked into place from the top of the plate eliminating the need for a workman to ever reach under a plate. It lifted the plate from the center, eliminating the dangerous spinning and swinging problems as well. Plates could also be safely stacked without dunnage. This tool was later replaced by the #750. 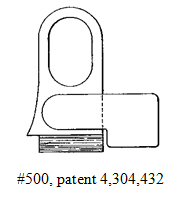 In 1984, an improved version of the 500 Lifting Tool was patented. The Lock-N-Lift Model750 is a 3-piece design with a center locking plate and is used with a shackle. 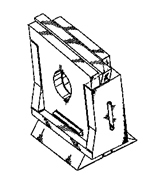 The dovetail design remained, as Fred recognized this style to be the most reliable, safest and easiest to use. This dovetail design has become the standard for all the Lock-N-Lift tools. The Model #800 was introduced in 1989 and patented in 2000. This tool resulted from industry requests to use the tool with a hook. 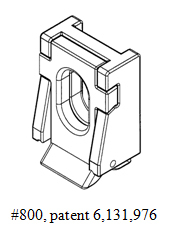 An earlier version of this part was included in Lock-N-Lift’s first Patent. It has an elongated hole that can accommodate a hook. A chain shackle can also be used safely. Fred also converted the tool to a 2-piece design for added convenience and ease of use.